I've been working on planting containers this morning and was making good progress. 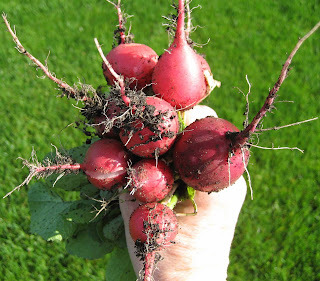 Then I took some stuff back to the compost bin and spotted these radishes, begging to be picked and eaten. So I picked them, photographed them, cleaned them and ate them. My motto is when the radishes are ready to pick, by all means pick them and eat them. Now that I've had this delicious morning snack, I need to get back to planting containers... break time is over! If I liked radishes, those look good enough to eat! I'm planting containers today, too! Don't know if you noticed yet but Colleen at InTheGardenOnline quoted your radish motto in her Garden Bloggers' Words of Wisdom sidebar thing. I LOVE radishes! For the past few weeks I've been making an appetizer plate for my husband and I to eat before dinner. Fresh sugar snap peas, carrots, cucumbers, and radishes. Dipped in a tangy dressing or just freshly sliced, you can't get much better than that! I threw some radish seeds in my veggie garden before I went away, thinking they would be growing by now. Nope, not a one, and no idea what happened to them. Guess I better put some more seeds in now that I'm back.